News, photos, videos and more about football hooliganism in Greece. Diagoras fans invaded the pitch and attacked Ialysos fans. Clashes between Atromitos and AEK fans after the end of the game. 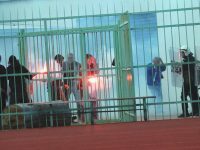 Aris fans clashed with riot police inside the ground during the first half of their third division match with Nestos Chrysoupolis on Sunday.